Did you see my picture on Instagram when we let the baby ducks swim in our pond for the first time? Those two trees were still on dry land last week! The water is rising. They are now calling it the 500 year flood. Our little hometown made the national news before I realized just how severe the storm was (and is). When you look at an overhead view, it now looks like we are on an island. We are surrounded by water and road closures, and rain is still falling. Every few hours the alerts start buzzing on our cell phones sharing about the dangerous flash floods. Very close to home and around us in every direction but north, roads are eroding, homes are filling with water, tragedy is terrifying. But evident also, rescues are happening. Miracles are happening. Please continue to pray for everyone affected by this unbelievable flood. If you haven't seen it in the news, this video is shocking. It's tragic and sad, but there is always hope. I had a different verse in mind originally, but with so many evacuating, this one seemed especially fitting. Thank you for joining Scripture & A Snapshot. Leave a comment with a verse that God has placed on your heart this week, or leave a link to your own post sharing a Scripture and a snapshot. Take time to visit some of the other links, too. Visit (or ask to join) our group Pinterest board for Scripture & A Snapshot, and come back each week for more encouragement. We had bad flooding about 7 or 8 years ago in an area I lived in. It was very difficult. I hope you will get through it with minimal damage. I pray for God's protection over you and your area! Praying for you and the people int he area, that the flooding would cease and no further damages cause! 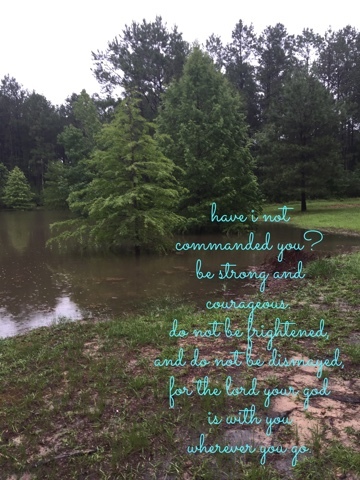 The news of the flooding can be disheartening, but we know God is still on the throne! Praying for those affected by the flooding in your area. Thank you all for your prayers. It's still unbelievable. I keep hearing of more and more friends whose whole home flooded.